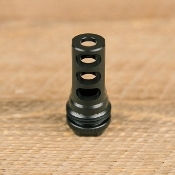 This 3-port muzzle brake is compatible with the ASR mounting system. They offer one hand on, one hand off attachment/detachment. The 3-port design effectively reduces felt recoil and muzzle climb. This is a QD (quick detach) muzzle brake specifically designed to work with SilencerCo silencers.